Who hates going to the vet more – my cats or me? It’s a toss-up, literally and figuratively. My three cats suffer terror for about an hour during the hunt and toss into carrier phase, the yowling drive there, the visit indignities (being pried or dumped out of carriers and having orifices probed), then the howling return drive. Once we are home, they are upset for another few hours, hissing at each other and growling at me. By the end of the day, all is forgiven and forgotten. I don’t enjoy any of this either, but I am more upset before than during. In fact, I start worrying the night before as I carefully bring out the carriers and line them up on my office floor. What if I can’t catch them all? What if one of them runs and hides in a place where I can’t reach (like under my bed)? What if one of them bites or scratches me and I die of an infection? Why don’t I have a boyfriend or husband right now? Why the hell did I get three cats? A few years ago I was taking care of an outdoor cat I had to take to the vet for a fight wound. Even with a neighbor’s help, I couldn’t hold Buster firmly enough to stuff him into the carrier. He was a sweet cat who belonged the neighborhood but there was no way he was going to endure being taken away. I was already running late for the appointment and finally called in desperation. The vet tech suggested we descend on poor Buster with a large towel or blanket. “That will calm him down.” It worked but I’m not sure I could have done it alone and poor Buster was suffocating in that writhing mass of blanket. So, for my three, Dewey, Lily and Zoe, this would be my last choice. I reviewed some advice online. I was a little out of practice, since I hadn’t taken the cats to the vet in two years (I moved and put off finding a new vet). 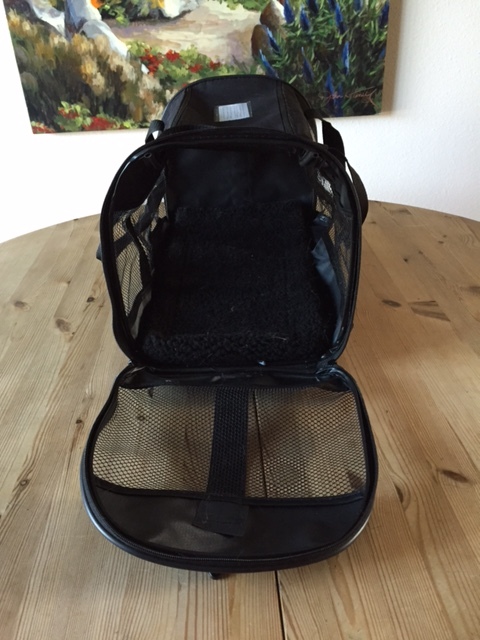 Keep carriers on firm surface, such as table, grab reluctant cat by scruff of neck. Oh yes, I remembered those worked. One article suggested “training” our cats to trust the carriers with a series of exercises (cat toys in carriers, moving them closer, etc.). This requires leaving the three carriers out permanently and a LOT of time. No thanks! I have a small apartment and hate clutter. By the time I finished all these steps, it would be time to go to the vet again! And while I have a friend whose cat loves to travel with her, I’m not planning any road trips soon, or even day trips, that include Dewey, Lily and Zoe, as much as I love their company. On The Morning, I decided to start with Dewey, the biggest, strongest and most frightened of my cats. Even though he is now 10 and very affectionate with me and his sisters, he runs from everyone else and hates to be picked up. When I adopted him at the age of two months, they told me at the Humane Society he’d been found abandoned and alone on a sidewalk; I guess that memory has never completely left him. I considered packing him up last, but was afraid the commotion of seeing his sisters carried off would totally freak him out. I had to sneak up on him in his closet sleeping space, pretend to pet him and before I could hesitate (she who hesitates is scratched), grab the scruff of his neck with one hand and his 17-pound body with the other. Ran to the carrier on the dining table, pushed him in and zipped it up. Phew! I felt like a scorpion pouncing on my prey. 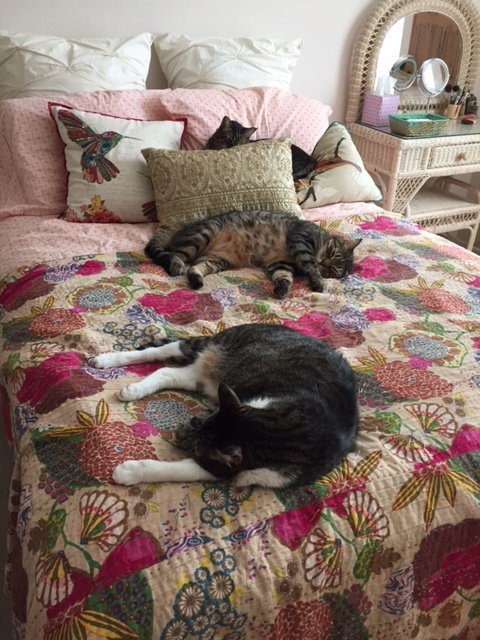 Six-year-old sisters Lily and Zoe are also large (17 and 15 pounds), but mellower and easy to pick up. Lily has even gone into the carrier on the floor by herself. Not this time, of course, especially with Dewey hissing. In the time it took me to chase and capture Lily, Zoe hid. My worst nightmare. When I made the appointment, I said I would like to bring the cats separately (or two together and one alone). However, they prefer seeing pets together – and offer a good discount. Guess I’ll miss out on the discount I’m thinking as I search. Finally found her behind a chest in my closet and like a mother lifting a car off her kid, I called on my super-human strength to pull the chest and grab that little brat. From there it was down the elevator, one wobbly carrier at a time, to my garage, hoping the manager would not see me, because she thinks I have two cats. But despite the wailing chorus, no one in the apartment building seemed to notice or care. If they did see me, they were probably glad it was me and not them. The vet techs helped me carry the cats in and the friendly vet, a big man with a big house and six cats and seven dogs, said my three feline friends were healthy. Good teeth, no fleas. Yeah! Good for another year.